Jesus said, "Go into all the world and preach the Gospel" Matt. 28:19. 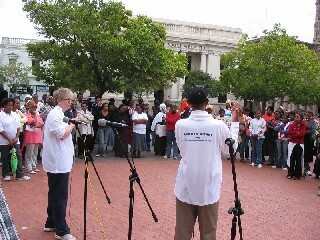 Julie and Young Ministry Group teams have been taking the Gospel into many countries since 1987. The YMG Mission Archive contains reports from a number of YMG Missions. 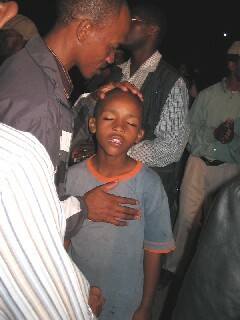 Another 1,200 commitments to the Lord Jesus were garnered in the Festival City of the Eastern Cape. Julie trained people from 18 local churches and ministries, participating in the "Discover Your Destiny" Campaign. Singers, dancers, tribal performers, storytellers and committed Christians took to the streets of the city and outlying townships to share their faith. Julie preached daily. Read the extraordinary things God worked through ordinary people, and how unity brings the blessing of God... Click here for the report. 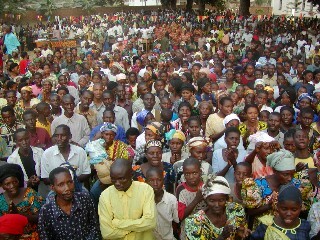 Nearly 1,200 adults (and hundreds of children) made commitments to Christ as the YMG Team shared the Gospel in 2 cities in the heart of Africa during the YMG campaign in Democratic Republic of Congo. Go! here to read the report. A YMG Team composed of three nationalities swept into Southeast Romania for a National Youth Music Festival in July 2004. Go! here to read this report on the power of God to heal and the people who gave their lives to Christ.